10 inch wide - Organize your life with these easy to install over the door hooks which involve zero use of power tools. This essential is for anyone who doesn't want to deal with the hassle of drilling in conventional hooks. You can use these hooks to organize your laundry, separate whites and colored for easy organization. Or pick your winter coats off the floor and tidy them away behind the closet door. These durable hooks can be used to organize your most used scarves, coats, and hats. You can also hang your handbags, keys and umbrella for quick access near the front door. You can also use these hooks to give yourself more room around the house. Get rid of that pile of stuff which is cluttering your home. This versatile product can also be used to hang towels in the bathroom to help them air dry and preserve precious space. Instead of thinking about ways to get your items organised, you just need our over the door hooks. It is the best way to insure a long lasting solution to everyone's organization problem. If you are looking for an easy fix, these hooks are perfect for you! Not only will you save yourself time but these easy to install over the door hooks are fool proof. All you need to do is firmly place your hooks over any door. They can be adjusted to any household door frame or closet. 15.5 inches wide - Organize your life with these easy to install over the door hooks which involve zero use of power tools. This essential is for anyone who doesn't want to deal with the hassle of drilling in conventional hooks. You can use these hooks to organize your laundry, separate whites and colored for easy organization. Or pick your winter coats off the floor and tidy them away behind the closet door. These durable hooks can be used to organize your most used scarves, coats, and hats. You can also hang your handbags, keys and umbrella for quick access near the front door. You can also use these hooks to give yourself more room around the house. Get rid of that pile of stuff which is cluttering your home. This versatile product can also be used to hang towels in the bathroom to help them air dry and preserve precious space. Instead of thinking about ways to get your items organised, you just need our over the door hooks. It is the best way to insure a long lasting solution to everyone's organization problem. If you are looking for an easy fix, these hooks are perfect for you! Not only will you save yourself time but these easy to install over the door hooks are fool proof. All you need to do is firmly place your hooks over any door. They can be adjusted to any household door frame or closet. 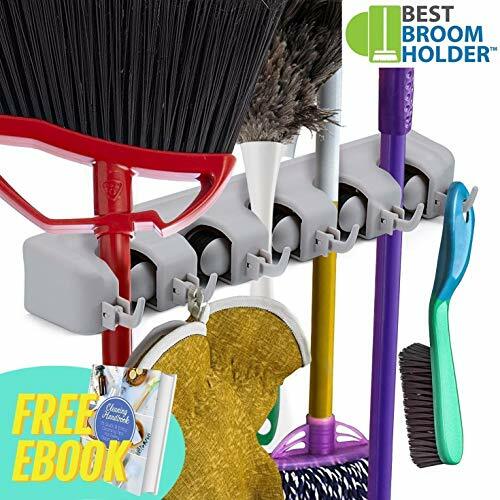 - BEST TOOL ORGANIZER WITH BEST PRICE - This mop broom holder is made of super sturdy ABS, ensuring superior durability that's worth every penny. ADD TO CART NOW and organize your tools stress-free! - HANG ANY TOOLS - This mop holder has 5 friction grips and 6 hooks to hang up to 11 tools. The strong grip can clamp different sizes of mops, brooms, heavy shovels, rakes, or even your tennis racket. - NO MORE MESSY ROOM - Tidy up your messy broom, mop, rakes, tools in the kitchen or garage shelving with this storage organization system. Hanging the mop also prevent it from getting moldy and smelly. - NON SLIDE GUARANTEE - Whether it's a wet mop or heavy shovels, nothing will slip off since this mop holder has 35 pounds holding capacity. Thanks to the spring loaded and double rubber gripped slots. - 5 MINUTES INSTALLATION - With screws included in the package, even the clumsiest of us can install easily in just minutes! Just prepare mounting screws, wall anchors, screwdriver, and you're ready. - THE DURABLE, CONVENIENT SOLUTION Plastic clip hooks break after just a few uses and are hard to open and close. Our quality hooks offer a 13/16" opening for ease of use and strong enough to truly stand the test of time. A space saving alternative to an expensive bulky floor stand dryer. Build your own clothes rack or shoe rack with these innovative clip hooks. Your imagination is unlimited for the multi uses of these versatile hooks in your home. 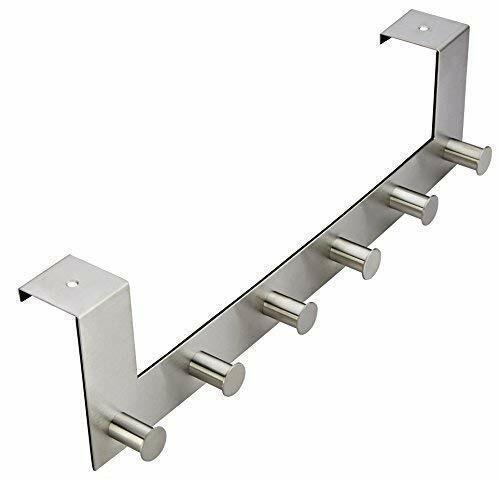 - ULTRA STRONG Heavy-duty, double plated nickel steel clips with integrated hooks can hang up anything with ease for storage or drying. Perfect for hanging everything from the heaviest adult sized coat or pair of jeans to baby diapers; store belts and scarves in the closet, hat collections, swimsuits, bridal wear. Strong enough for one clip to hold a pair of your heaviest set of boots. Keep a set handy near the laundry clothesline for hanging extra heavy beach towels and bed sheets. - NO MORE MARKS! Unlike wire or wooden clothespins, these clothing clamps won't leave impressions on your delicate clothing, as the metal teeth are covered with nylon padding for a non-slip grip. Polished chrome hook loops leave no marks or scratches on any shower curtain rod or door. Convenient damage free solution for boot storage of expensive dress shoes, cowboy boots, suede boots, leather footwear, rubber boots, and even vinyl fetish wear. - KEEP CLOTHING & ACCESSORIES AT THE READY ANYWHERE Use in your closet, in the bathroom, in an entryway or even in the kitchen. Hang clothes out to dry or organize them in the laundry room. Pack them in your suitcase or bag to use when you're traveling in a motel, hotel or even a tent! Perfect travel set replacement for clothespin, boot clip, boot hanger, hanging hooks, clothes hanger, hanging clothes pin, drying rack, hanging clips, or a clothes drying clothes pin. - ABSOLUTELY LOVE IT OR WE'LL GIVE YOU A FULL REFUND! Try it today and buy with confidence with our simple, hassle-free, no-questions-asked 100% MONEY BACK SATISFACTION GUARANTEE! If for any reason you aren't happy we will immediatly refund your full purchase price. Tough durable construction and fine workmanship details are confidently backed by the manufacturer's risk-free LIFETIME REPLACEMENT WARRANTY that covers any defects when purchased from authorized resellers. - MULTIPURPOSE. You can hang almost anything. The hooks versatile design accommodates different types of items, may it be clothes, bags, keys or toys. Know where to find your car keys, scarf or bag even when in a hurry. Once you have these in hand, you'll come up with hundreds of ideas on how you can become even more organized and do more with the time that you have. Suitable for all homes with doors, these hooks are a match made in heaven. - 10 INCH WIDE - REMOVE CLUTTER FROM YOUR HOME. Tired of the clutter in your home? Remove the problem by using the space behind your door. Simply hang your jackets, scarfs, umbrellas, bags or keys on the 4 hooks provided, safely out of sight. Get enough space to hang your items. Makes a great key holder hidden behind doors. The great thing about these stainless steel hooks is that you can hang them on just about any door all over the home or office. Universal hooks are compatible with most doors. - DURABLE AND HIGH QUALITY STAINLESS STEEL. Strong enough to hold your bag or jacket without bending which also guarantees their long life. Don't waste precious time searching through a cluttered closet for your jeans or sweater. Immerse yourself into the Pro Chef Kitchen Tools process even more knowing that everything essential is within reach at all times. 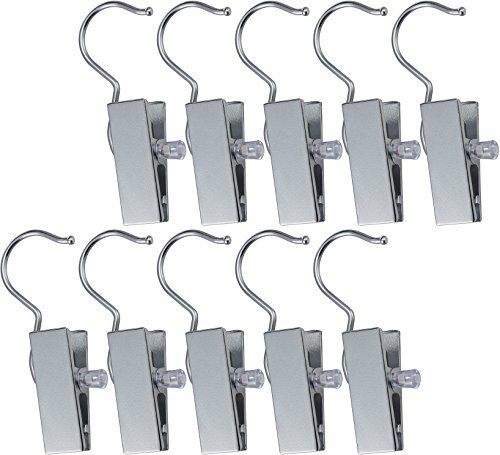 Made of durable stainless steel, these hooks let you hang items securely without screws or any sort of adhesives. - HIGH QUALITY DESIGN. Save time and money with these DIY over the door hooks. The hooks are ready for use and you don't need to pay for installation. Safe even for your most expensive bag. The hooks are round with smooth ends plus a high-quality finish that leaves your items with no tears or scratches. These hooks blend in well with the rest of your décor given their stainless finish. The best part of these hooks is that they will not damage your doors and are sleek and modern. 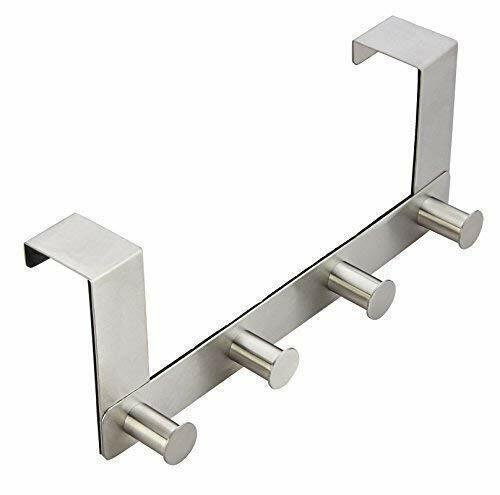 - Made from high-quality stainless steel, providing door hook rack long-lasting strength. It will hold a large jacket without bending or losing its shape. Places everything within reach yet has the quality materials needed to hold up for years of use. The stainless steel has a shiny finish that looks fantastic in any setting. You won't have to worry about door hangers loosing their function because of the strong stainless steel. - Fits nicely over a door frame, allowing for convenience and giving plenty of choices for placement. Kitchen storage or pantry door is wonderful for hanging this door hanger. Door hook rack has a large hanging arm at the top that will fit on a wide variety of doors. Great for use in bathroom door, kitchen door, or entryway door. Door hanger adds versatility and ends the clutter in your home. - 5 INCHES WIDE - Door hanger has six pegs that are perfect for a hanging many different kitchen utensils. Get enough pegs to hang many of your favorite and most handy kitchen items. Makes kitchen more organized and easy to work in by giving lots of hanging pegs. With multiple pegs, you will rest assured that your useful items can be hung, removing messes from your kitchen. Lots of pegs brings better versatility to the kitchen. - Not just for the house! Door hanger makes a perfect addition to commercial kitchens, creating utility and making a working kitchen efficient. Hang spoons, ladles, aprons, and many other items found in a professional kitchen. Increase the ease and efficiency and the kitchen will be working at a great pace. Brings a strong, sturdy hold to your storage. Hook hanging rack is essential for a well-managed restaurant kitchen. - Hang virtually anything you can image. Stainless steel holds utensils and tools, but can also be used to hand heavy winter coats, sweatshirts, jackets, and more. Use this hook organizer inside your walk-in closet and get more storage and organization from a simple tool. Use as a coat hanger near the entry way or store all items in the outdoor shed. Versatile door hangers used for nearly all purposes! Warranty Tough durable construction and fine workmanship details are confidently backed by the manufacturer's risk-free lifetime replacement warranty that covers any defect in materials or craftsmanship in your investment when purchased from authorized sellers. Tough durable construction and fine workmanship details are confidently backed by the manufacturer's risk-free lifetime replacement warranty that covers any defect in materials or craftsmanship in your investment when purchased from authorized sellers. Tough durable construction and fine workmanship details are confidently backed by the manufacturer's risk-free lifetime replacement warranty that covers any defect in materials or craftsmanship in your investment when purchased from authorized sellers.